Washing and drying your clothes is necessary for everyone, unless you don’t mind walking around smelly and dirty. Most people will end up doing a load of washing at least a couple of times a week, so having a good washing machine and a good dryer is crucial. But why should you have two appliances taking up space in your laundry room when you could buy one that does it all? That’s the basic logic behind ‘washer dryer combos’, which supposedly offer the practicality of a washing machine and the convenience of a clothes dryer. But are they as good as they sound? We’ve done some digging to see if they’re really worth your money, and what you should be looking for if you decide to buy one. The idea of combining your washing machine and clothes dryer into one handy unit seems like a no brainer. But is it really that simple? What are washer dryer machines? A washer dryer machine – also known as a washer dryer combo – is a front loader washing machine and a condenser clothes dryer combined into one convenient appliance. A condenser dryer is a dryer that recycles dry air rather than venting it outside, while a front loader washing machine is simply a washing machine that opens from the front, rather than the top. You can use these machines just like you would a normal washing machine, but with the added benefit of drying your clothes once the washing cycle has finished. In some machines, you also have the option to set it to wash and dry your clothes all in the one cycle, without needing to do anything in-between. You can go out for two hours and come home to washed and dried clothes! Sound perfect. Why buy a washer dryer combo? One of the main reasons people buy washer dryer combos is to save space. One washer dryer is roughly the same size as standard washers or dryers separately, so having these two machines rolled into one can save a significant amount of space in your laundry room. Another reason is to save money. Washer dryers are quite expensive to buy by themselves, but will generally cost less than buying two different appliances separately. We will cover the cost aspect of buying a washer dryer combo later. However, probably the main reason people buy washer dryer combos is simply the convenience of them. The ability to both wash and dry your clothes without having to take them out and move them is a huge draw for many. Add this benefit to the fact that they give quick and solid results, and you’ve got a machine that you should really consider buying. How much do washer dryer machines cost? 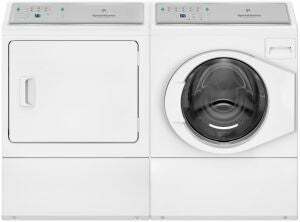 A standard electric standalone washer or dryer will usually set you back around $500, which is very cheap for a machine that is supposed to last you around 10 years. Comparatively, washer dryer machines tend to be a bit more expensive. According to Appliances Online, the prices of washer dryer combos in Australia range from a low of about $800 – to a high of more than $5,000 for the more luxurious models. So they cost a fair bit more, but that’s kind of the point isn’t it – you’re buying one appliance to do two jobs. The question is: Are they worth it? How big are washer dryer machines? Washer dryers tend to be around the same size as a standard front loader washing machine or clothes dryer, about 25-35 inches wide and 35-45 inches tall. What you really need to consider, however, is the load capacity you require. The capacity in kilograms you can see here refers to the weight of dry clothes, not wet clothes, since wet clothes take on extra weight. You should try to put slightly less than this capacity into your washer just in case your machine overloads during the washing cycle. We recommend that you always read the product information closely to ensure you have the right sized machine for your requirements. You’ll also need to make sure the washer dryer actually fits in your laundry or designated space. Bust out that tape measure and carefully measure the space where your new machine will go to the nearest millimetre. Leave about three inches or so to make room for the wires and pipes on each side, particularly the back. If you can’t fit it into your laundry, it’s of no use to you. Who are washer dryers suited to? Because of their smaller capacity (the drying component typically holds about half the capacity of the washer), washer dryer combos are ideally suited to small households, or to people who live in small units or apartments, where space is at a premium. This is why you usually see them in hotels! Combo machines work best with relatively small washing loads, which is why they tend to be unsuitable for large families that use their washing machine and dryer quite a lot. This is mainly because they aren’t designed to handle large drying loads, and because you can’t do a second load of washing wile the first is in the dryer. If your laundry needs are more significant, you’d probably be better off buying your washing machine and dryer separately. How energy efficient are washer dryers? There are two kinds of washer dryer machines – vented and ventless. We’ve already discussed what ventless (condenser) dryers are – they recycle the warm air they use rather than releasing it outside. Ventless machines are almost always more energy efficient than vented ones, which is balanced by them being more expensive to buy. When it comes to overall efficiency, studies have found that combo machines are better than the two machines working separately. The enhanced efficiency of combo units is down to their reduced hot water usage and washer mechanics. Many models come with spin cycles of more than 1,000 rotations per minute (RPM). So while they will lack the sheer energy saving prowess of individual drying machines like heat pump dryers that can save 50% more energy than standard dryers, combo dryers will save you a decent amount over time. Just make sure that you look for a high energy star rating to learn whether the model you’re buying is an energy guzzler or not. A standard family of four using a standard combo machine can save roughly $100 a year if used correctly. Who sells washer dryer machines? Despite their obvious benefits, washer dryer combos are not as popular as some of the other types of washing machines and clothes dryers mentioned above. However, there are still quite a few options out there for consumers keen to buy one. Here is a guide to some of the leading brands and what they currently have on offer. Hit the links below to check current prices with Appliances Online. 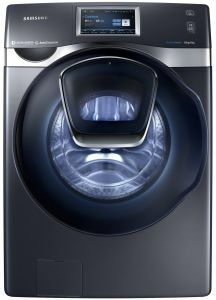 Samsung has four different washer dryer combo models in its range, costing as little as $1,199 and as much as $2,999. Samsung seems to have designed its washer dryer machines to be of perfect use for both people who live alone and those who have families. The special AddWash feature means you can also throw in forgotten items after the cycle has started. 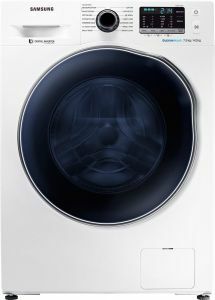 The biggest Samsung model – the AddWash WD16J9845KG – has an enormous capacity of 16kg for washing and 8kg for drying. It has a distinctive charcoal colour, adding to the black appliance trend. Featuring 18 cycles with a Delay End option, it allows you to program the washing and drying around your schedule. Additional functions include the Smart Error Check technology for troubleshooting and the 8” LCD touch screen that displays cycle information and settings that can be customised to your load. It has a four star energy efficiency rating, using around $171 in energy per year, according to the Standard Test (based on 29c/kWh). LG has a large range of washer dryer combos, priced between $1,299 and $3,999. These models are quite expensive, but may still represent good value for money thanks to their wide range of programs as well as extra features, combined with LG’s solid reputation for making high-quality products. At the lower end of the price spectrum, you have the LG WDC1475NCW Washer Dryer combo, which has an 7.5kg load capacity for washing and small 4kg for drying. Expect 13 programs and a Smart Diagnosis system that troubleshoots problems via the LG app. It has a 3.5 star energy efficiency rating for washing and three stars for drying, with a total of $107 in energy usage per year. 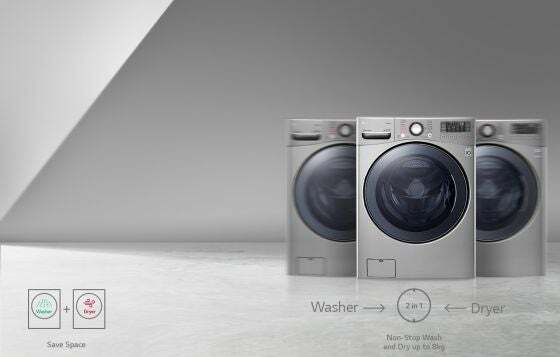 For top of the range, the LG TWIN171215S TwinWash model allows you to wash two separate loads (15kg top compartment & 2.5kg bottom compartment), as well as dry a load of 8kg. For a discounted price, you might score three appliances in one with this TwinWash combo for just under $3,000. Speed Queen has just one washer dryer for sale, with a retail price tag of $5,295! This one is quite unique as it has the dryer and washing machine side-by-side rather than together, which means it’s significantly bigger as a result. 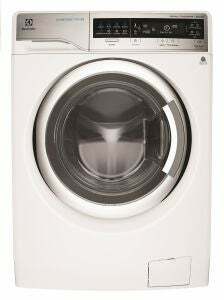 However, it has a huge 1200RPM spin speed, with a massive 10kg capacity washer and 9kg dryer. It features 10 different programs, including Heady Duty, Delicate and Quick Dry option. Additionally, it comes equipped with an electronic touch control panel. Unfortunately, it only has a 2.5/6 star energy efficiency rating, despite being a gas model. And according to the Standard Test, this unit will use around $185 each energy per year. In terms of water efficiency, it’s rated three stars. Given that one of the major benefits of washer dryer machines is that you get two appliances in one, you may be wondering what the big draw is with this Speed Queen model when you could buy a separate washing machine and dryer for less! That’s a fair point! 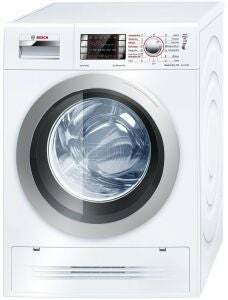 Bosch also has just one washer dryer – an 8kg/4kg Washer Dryer (WVH28490AU). With a retail price tag of $2,099, it has a high energy star rating of 4.5/6 and has an extremely powerful spin cycle of 1400RPM. One drawback is that it does have a small load capacity of just 4kg for drying and 8kg for washing, but this should still be enough for the main target audience that it’s trying to reach. Programs include a Refresh cycle, Gentle dry, Super Quick 15’ and Intensive dry. It features an automatic self-cleaning system to keep the condenser lint free, as well as a time delay option to select an end time of your wash up to 24hrs in advance. In terms of design, it has an extra-large LED display with touch control buttons and ‘AntiVibration’ Side panels to help reduce vibrations and minimise noise. With two models to choose from – costing $1,399 and $1,999 respectively – Electrolux’s washer dryers may represent good value for money in spite of their relatively high prices. 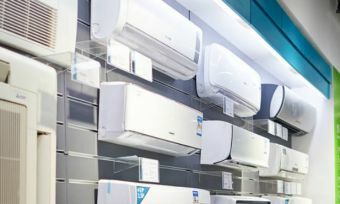 Its machines come with up to 16 automatic programs to make your life more convenient, and you could save a fair bit of money in electricity costs over the years with four and five stars energy ratings. 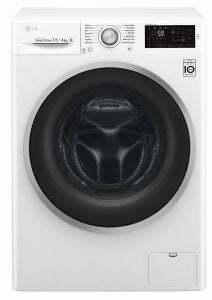 The 10kg/6kg UltimateCare unit (EWW14013) is boasted for its ‘WashDry 60 minute’ program – perhaps ideal for those with busy lifestyles – as well as premium features such as the Ultra Mix technology that pre-mixes water and detergent, and the load sensor that displays the laundry weight of every wash to ensure that optimal time, water and energy is used with each load. The Vapour Refresh cycle is also stated to freshen and revive clothes without washing. Extended tumbling: the cycle will run for a few more tumbles to help release excess wrinkling from your clothes. This doesn’t negate the need for an iron however. Other useful features you should look for are digital and LED displays, Wi-Fi compatibility and of course a high energy star rating. Clean the lint filters regularly: blocked filters make it harder for the dryer to circulate air through your clothes, which along with being less efficient, is also a fire hazard. Wait until you have a full load: why do two separate loads when you could easily fit all of those clothes into one? Use nature: sunlight doesn’t cost you a cent, so use it as much as possible! Only use your dryer if you need to dry certain clothes in a hurry, or if the weather is poor. This dryer type is extremely energy efficient so this might not be that much of a problem, but it can still save you quite a few bucks over the years. If you keep doing these as much as possible, you’ll find that the cents you save will add up over time! There are several different types of dryers out there for you to choose from if you’re not settled on a washer dryer combo. We’ve compiled a summary of the pros and cons of each of them, to give you a better idea. Alternatively, you can read our articles on each for more information. Eliminating the need to buy and store two separate appliances, a washer dryer combo could be a great investment if you live in a small apartment or house and need to save as much space as you can. Even if this doesn’t apply to you, there are certain models out there that are suitable for those living in large homes with families too. They are more expensive than a standard washer or dryer it has to be said, but you might find that most washer dryers are better value than buying the two machines individually. Factoring in their price with the high levels of convenience you’ll get, as well as decent energy efficiency, washer dryer machines are – at least on paper – a great option. But you’ll have to ask yourself why they are not more popular than they currently are. Is it simply that most Aussies just don’t feel the need to combine their laundry appliances into one? Or does doing so mean that these machines are simply a jack of all trades, but master of none? You decide!